Heat and Glare a problem? Is your furniture fading because of the sun's intense rays? Glare streaming through your windows, making it difficult to watch television or look at the computer screen? Is your room hot like an oven during the summer and cold during the winter, making it unpleasant to even sit in? Is your privacy being invaded by neighbours being able to look at you through your windows? Is glass at low levels inside and outside your home a safety hazard for your children? Window Film is the Answer! At 21st Century we have a large selection of window films to suit your needs. These films can be fitted to nearly any glass - old or new. All of our films come with a UV Inhibitor to stop 99% of the harmful UV rays which contribute largely to the fading of your fading of your furniture. Not only do Window Films stop 99% of the UV that causes fading, they also inhibit the solar heat and light from the sun without affecting the view. In the heat of the summer 21st Century Solar Films can keep you cool by rejecting excess heat coming in through your windows - and in winter they can also provide some insulation on your glass to keep the heat in! We also use a number of films that provide semi or complete privacy. Treatment with COOLKOTE prevents the heat from building up under polycarbonate, reflecting the sun's heat away before it can be transmitted. Immediate and dramatic reductions in internal daytime temperatures are achieved. COOLKOTE is a high-performance metalised pvc coating, providing an inexpensive and extremely effective solution to the problem of heat build up.Its metalised surface creates a dramatic reduction in the incoming solar heat by continuously reflecting it a way. The COOLKOTE product is installed by our professional installers, for a quick, clean installation with the minimum of disruption to you and your home. Our security film will help to prevent break-ins and personal attacks by strengthening the glass. 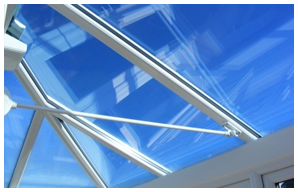 Our safety film will hold the sharp pieces together in the event of an accident.